All our Pizzas are made freshly homemade, topped with special tomato sauce, mozzarella cheese and fresh ingredients. A Platter is half a pizza served with chips, and your choice of coleslaw or any dip. 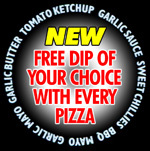 Extra toppings available for just 70p each. Cheesy stuffed crust available for just £1.00 extra. Extra toppings available for just £1.00 each. Cheesy stuffed crust available for just £1.20 extra. Extra toppings available for just £1.50 each. Cheesy stuffed crust available for just £2.00 extra.